Election Day is a week away. Do you have a voting plan? If not, make one. It turns out that the best way to make sure we do something, is to plan to do something. The candidate votes for herself! Pull out your calendars, find November 6, and schedule a time to get to the polls. After you make a plan to vote, make a plan to help! We need lots of people to help us get out the vote (GOTV), and there are lots of ways you can be part of our GOTV Team! Phonebanking. Make calls to remind people to vote. Sign up here or contact Bas Phair with questions. Phonebank with me & Christine Hallquist, Candidate for Governor, Sunday at 1:30 in Middlebury! Sign up for a shift then to Call with Christine! Canvassing. Knock on doors to remind people to vote. Sign up here or contact Bas Phair with questions. Special Canvass with me & Christine Hallquist, Candidate for Governor, Sunday at 12:30 in Bristol! Sign up for a shift then to Canvass with Christine! Honk & Wave. Generate excitement and remind folks to get out and vote on Election Day. Dress warm and bring your Ruth sign. 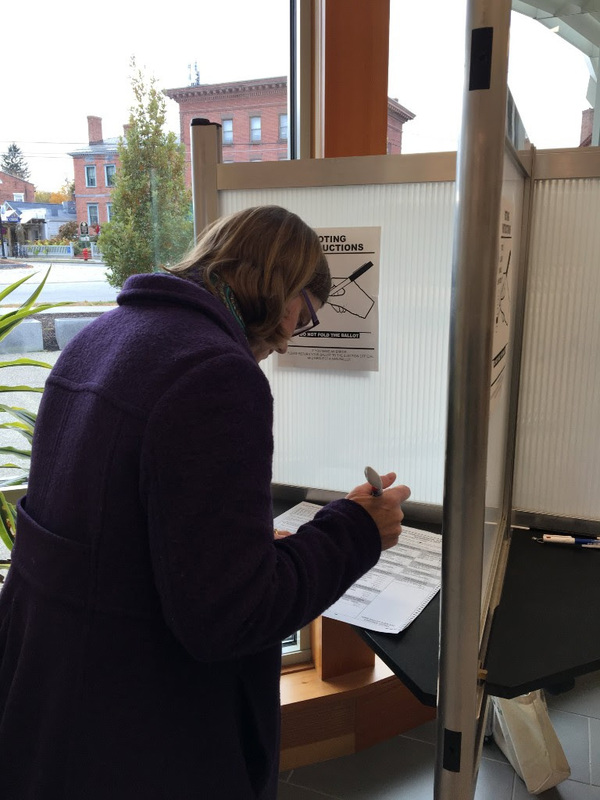 Join Middlebury College students & community members at MiddVOTE’s #VoteTogether Party at the Polls at the College Park in Middlebury, 4:00-6:00pm. Join Addison County Democrats at the Middlebury Inn, at 7:00pm after the polls close on Election Night. We’ll monitor results in Addison County and around the state, and hopefully have much to celebrate. RSVP here. Thank you for all you’ve done to get us this far. Let’s not slow down in this final week. Make a plan to vote and help! We’ll need all hands on deck at the polls and in our towns to be sure we come out on top! Next postLet’s Finish This Race!